Office Space - Somerville, New Jersey. 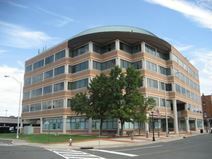 This state of the art and technologically innovative business center installation is located in the heart of Downtown Somerville and provides a significantly diverse range of professional standard and premium quality office space solution packages ideal for start-ups and entrepreneurs; in addition to the larger requirements of hugely successful major corporations. There is also a conference room available for rental.